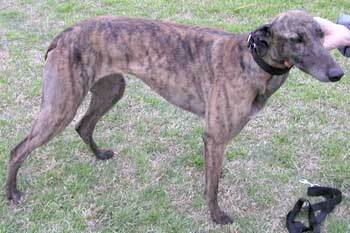 Dixie, aka AZ Beaudreaux, is a petite 2½-year-old beautiful dark brindle female, born September 28, 2000. Dixie's grand sire is Oshkosh Racey. She raced in the Valley from September 2002 to March 2003 and is ready to find her forever couch. Dixie is a little timid and still getting used to her life away from the track. She grows more confident each day, and is responding very, very well with obedience training. She is gentle spirited, sweet and curious about all around her. She doesn't seem to mind cats, just a little curious about them. 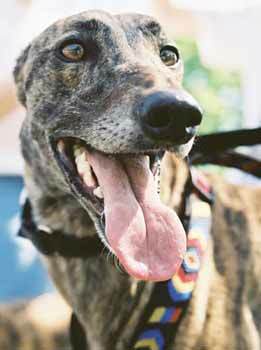 Dixie is a very quiet and sweet greyhound who is adjusting to home life very well. She has a shy, non-aggressive temperament, and with a little reassurance (aka bones and rubbing her ears) will warm up to most people rather quickly. She was very patient when I worked with her on climbing stairs, she would stand on the stairs waiting for me to place her front foot, then her back foot on each stair. I live on the third floor, so stairs were at first a big obstacle for her, but now she climbs them as if she has done it her whole life. She loves to go on long walks and prances the whole way. Nearly every time we go out, a neighbor will comments on how unique her color is and how cute her face looks. Dixie has been a very good 'inside'dog. She knows when it is time to go outside and when it is not. Dixie also crates well. On the first day of bringing her into my apartment, she went straight to the crate I had set up for her, and now that is her favorite spot to sleep. She stays in her crate all day, when I am at work, and doesn't seem to mind it at all. Dixie usually sleeps all night and does not wander around; she stays on her blanket in my room until I get up. Dixie responds well to 'no', although I haven't really had to reprimand her for much because she doesn't really 'get-into-anything'. Dixie doesn't seem to mind other dogs, just accepts their presence and goes on about her business. She also doesn't seem to mind cats, just a little curious about them. Dixie is a very bashful greyhound who needs a home that will give her lots of attention and the love she deserves.